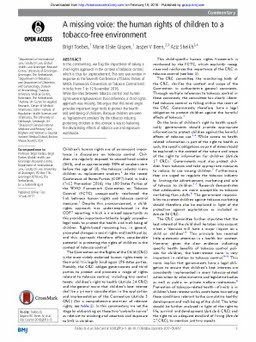 In this commentary, we flag the importance of taking a child-rights approach in the context of tobacco control, which is thus far unprecedented. This text was written in response to the Seventh Conference of States Parties of WHOs Framework Convention on Tobacco Control held in India from 7 to 12 November 2016. While the links between tobacco control and human rights were emphasised at this conference, a child-rights approach was missing. We argue that this novel angle provides important legal tools to protect the health and well-being of children. Because children are seen as’replacement smokers’ by the tobacco industry, protecting children in this context is key to haltering the devastating effects of tobacco use and exposure worldwide.